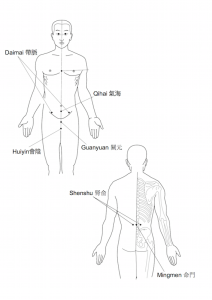 There are a few major acupuncture points that relate to the Dantian. The Dantian is the centre of the body and we need to have many ways to access the Dantian. The first major point is at the front and this is the Qihai 氣海 point. This one we have already discussed. The next point is at the back, on the spine at the same level as the Qihai point and this is the Mingmen point. This is like the backdoor of the Dantian. Then, below the Qihai point, four finger widths below is the Guanyuan 關元 Point. This is the third most important point and this is like the basement of the Dantian. Next we have two Daimai 帶脈 points on either side of the Qihai point. There are found on the front of the hip bones and they are like the windows of the Dantian. We also have two back windows, the Shenshu 腎俞 points. They are one thumb side, level next to the Mingmen 命門 point. 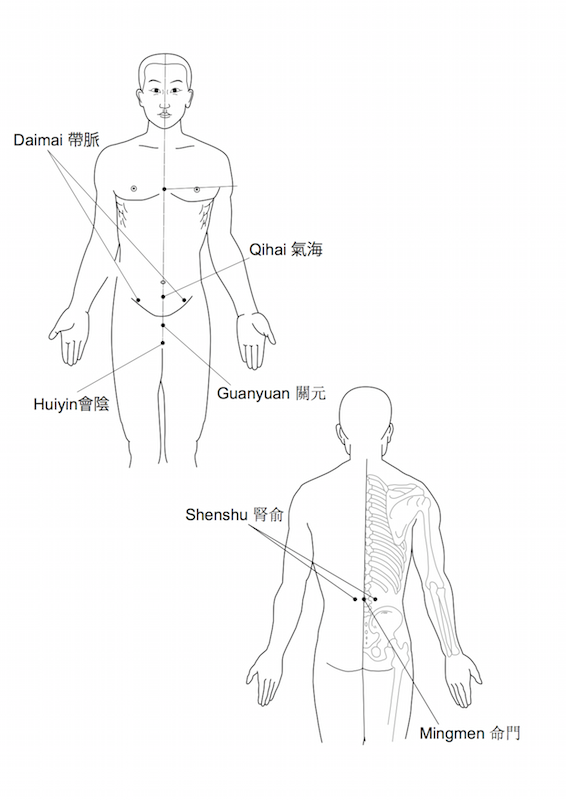 At the bottom of the Dantian is the Huiyin 會陰 point and this is found at the centre of the body between the legs. These are all important points that relate to the Dantian. We must know where they are and we should know which ones should be open, which ones should be closed and which ones can sometimes be open and sometimes be closed. When the Dantian is strong and full of Qi we can feel these points and so we will know their exact locations. Could you please share more about which ones should be open or closed? When and how do we do this or does it just happen naturally?